One of the most famous scenes in film history is that of the baby carriage bouncing down the steps of the great steps of Odessa. 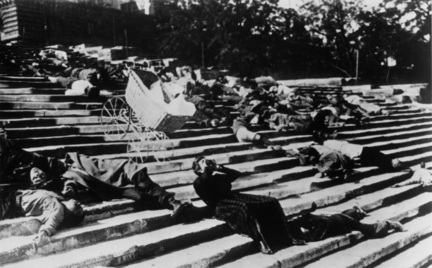 The film is Sergei Eisenstein’s 1925 Battleship Potemkin. The film, newly restored in 35mm was recently shown in LA and I drove in to see it. I was so pleased to see this historic film.